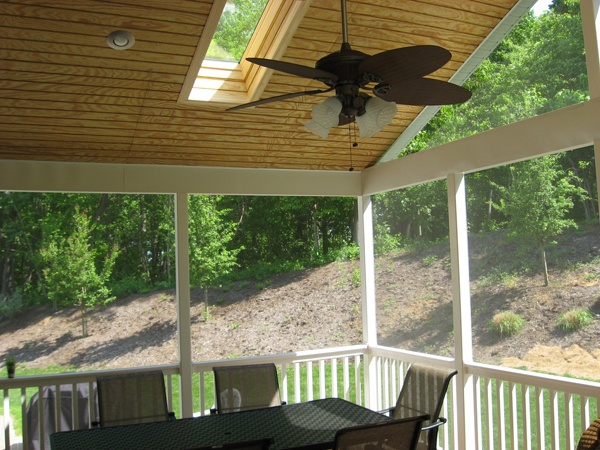 Enjoy your screen porch to the fullest when your panels are clean. If you’re thinking of investing in a screen porch before the scorching heat of July hits, then you are going to find yourself with some PGT® Eze-Breeze® Sliding Panels in your life. We use these types of panels because of their exceptional durability, their customization options, and their versatility. They can be installed around almost any porch because each and every one is custom made. Now, once you’ve invested in your new screen porch, you will want it to last as long as possible. The best way to stay on top of that is to make sure your PGT® Eze-Breeze® Panels are cleaned twice a year. Let’s take a look at how you should go about getting that done. Before you get to cleaning, you need to pause and make sure you’re ready. Remove all jewelry or other items that could catch on the vinyl and tear it. Make sure your pets, if you have any, aren’t near your panels while you are cleaning them for the same reason. An overzealous dog may not mean to damage your PGT® Eze-Breeze® Panels, but a misplaced paw might leave you in need of a replacement. You should also make sure that your panels have cooled before working on them. Now, all you’re going to need is a soft cloth, a hose, and your vacuum cleaner. Do not use any ammonia or alcohol based detergents, soaps, or cleaners. These types of products will damage your vinyl and void the warranty. Once you’ve removed your panels from their frames then you can begin to clean them. The first thing you can do is gently vacuum them with the soft-bristled brush attachment. Make sure you get all the corners thoroughly. Once you’re finished with that, you can move on to the tilting stage. You need to tilt all the panels inward so that you can clean them gently with water, Woolite, or Murphy Oil soap. Once you’ve wiped them down and let them dry, return them to their original position. Your vinyl can also be cared for with a special cleaner provided specifically by PGT®. This cleaner will prolong the life of your panels as well as deter dust from sticking to them. If you have any questions about your PGT® Eze-Breeze® Panels, please contact Mid Atlantic Deck & Fence (MAD Fence) today by clicking here or calling 1-800-833-9310. We proudly serve Anne Arundel, Baltimore, Howard, Montgomery and surrounding counties.